We are thrilled to be celebrating 20 years of publishing new Australian recorder music and as part of this we are inviting recorder players and recorder ensembles from around the world to do a video recording of one (or more) of our Publications to share in our celebration, in return you get the piece you want to record, plus two other pieces for FREE! This celebration is about sharing Australian recorder music with recorder players from around the world. At Orpheus, we wish to celebrate the recorder and its music, the recorder’s ability to inspire incredible compositions, create ensembles and communities around the world. Represent your country and recorder ensemble (or solo recording), so we can hear your interpretation of our music from the last 20 years of Orpheus Music Publications. Register your group or individual entry, and choose from over 300 Orpheus Music Publications that you would like to record. You will be emailed the music and you can begin rehearsing to record.There will be two categories to choose from - Solo and Groups recordings. You will also need to complete a media consent form. When you have completed your video recording, you will be emailed on how to load your video to the Orpheus Music YouTube channel. Your recording will be shared on Facebook, Orpheus Music YouTube channel and possibly listed with the publication on the Orpheus Music website. We are open to receiving recordings between April 15 and December 1 2019. Popularity votes will be taken at the Recorder Boutique January 2020 and via Facebook between January and March 2020. The results will be announced as a countdown (1 each week) from April 2020. 1st Prize: 10 Orpheus Music Publications, lizard postcards, Orpheus pen & bag, 3 Orpheus CD. 2nd Prize: 5 Orpheus Music Publications, lizard postcards, Orpheus pen & bag, 2 Orpheus CD. 3rd Prize: 3 Orpheus Music Publications, lizard postcards, 1 Orpheus pen & bag. At our annual Recorder Boutique in January 2020 where we will be marking 25 years of Orpheus Music and 20 years of Orpheus Music Publications. We will showcase a selection of the video clips from around the world. Group and/or Individual must register and are thereby agreeing to the Media Statement. Music can only be selected from Orpheus Music Publications with PDFs available. If you or your group would like a physical copy normal charges apply to music and postage. Group and/or Individual can choose one piece to record and then may choose two other pieces after the submission of the youtube recording. Those participating in Popularity Vote: Group Category understand that it is one prize per group, not per person. Individuals/Groups may submit more than one recording of different Orpheus Music Publications if they wish, however, you will only recieve two extra pieces per individual/group, regardless of how many submissions are made. Orpheus Music will try to accommodate your first preference to record your individual/group video, however this might not always be possible, and you may be sent your 2nd or 3rd preference to record instead. I hereby consent on behalf of myself and everyone else in my ensemble to Orpheus Music to take or have taken by others, photographs, digital images and/or audio and/or video footage of the individual or group listed below, and to store the images/video/audio files and make copies and publish the images/video/audio in any form, in whole or in part, and distribute them in any medium including, but not limited to, print media, video, audio, the Internet, Youtube, Orpheus Music Website, Facebook and other social media platforms. • General news or promotion of the event on TV, Radio or in Email Newsletters, in trade and other journals, on websites and social media platforms and the internet, at events and workshops. 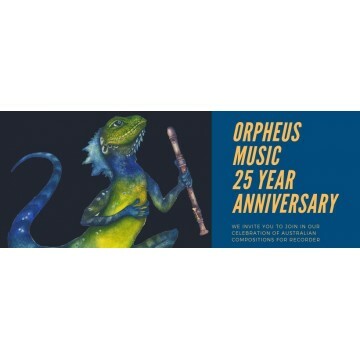 • The production of Orpheus Music 25 Year Celebration and Orpheus Music Publications website and annual Orpheus Music Recorder Boutique. Orpheus Music undertake not to use any images/videos in a way that would cause embarrassment or misrepresent the intent of the group/individual participation. We'll be making announcements throughout the year on our website and Facebook page with exciting news about our celebration and our Orpheus Music Recorder Boutique 2020.